Leader of the Nigerian Maritime Administration and Safety Agency (NIMASA) Team, Director, Special Duties, Hajia Lami Tumaka,middle and staff from the Abuja Zonal office, presenting relief materials to NEMA Officials at the Internal Displaced Persons Camp(IDP), Durumi, Abuja( FCT). 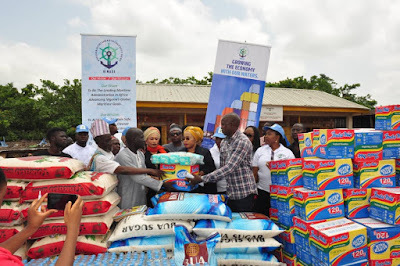 The Nigerian Maritime Administration and Safety Agency (NIMASA), has donated relief materials to some Internal Displaced Persons (IDP) camps across some affected states in Nigeria as part of its corporate social responsibility. 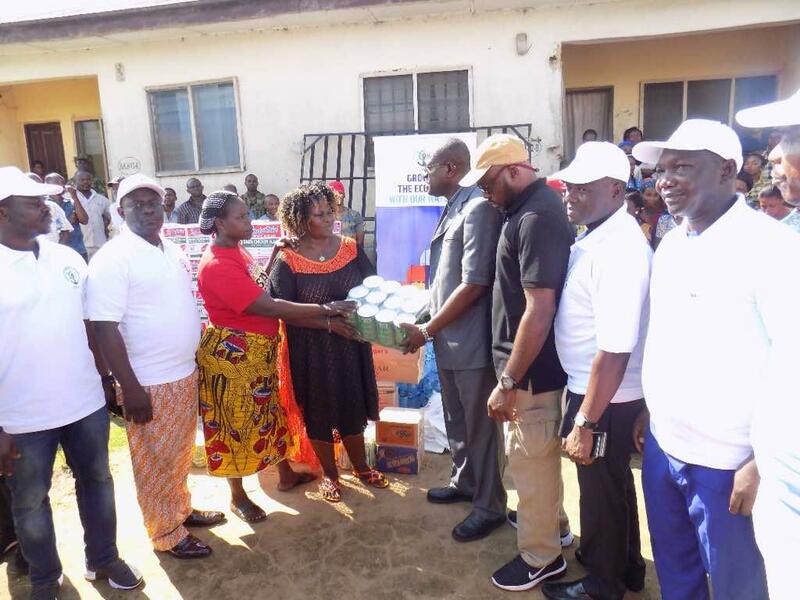 The Head, Public Relations, Nigerian Maritime Administration and Safety Agency (NIMASA), Mr. Isichei Osamgbi presenting relief materials to the Coordinator, at the Bakassi Internally Displaced Persons (IDP) Resettlement Camp in Cross River State. 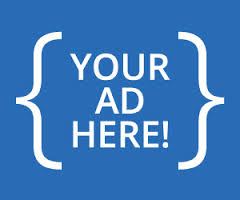 Along that effort, the Director General of the Agency, Dr. Dakuku Peterside used the opportunity to call for more support from well-meaning Nigerians and corporate organizations. The NIMASA DG who was speaking at one of the IDP camp in Abuja noted that people at the IDP camps across the country are integral part of Nigeria; hence they should not be neglected nor discriminated. “We must share in the grief of our fellow citizens, as no one wishes to find his or her self in any camp, knowing fully well that the comfort there is minimal. Let me also assure you that in no distant time from now, you will all return to your abodes as the Federal Government is committed to ensuring that your safety is paramount. “For us in NIMASA we are not just concerned about the well-being of the maritime sector, but as a corporate socially responsible Agency, we are concerned about your welfare; this is why we are here to support you the best way we can,” Dr. Peterside said. The DG who was represented in the camp by the Agency’s Director, Special Duties in charge of External Relations and Technical Cooperation, Hajia Lami Tumaka noted that the Agency will continue to support all initiatives by the Federal Government to ensure their welfare and safety is guaranteed. Similarly, the Agency’s Director of Internal Audit, Mr. Victor Onuzuruike represented the Agency at the Gubio IDP Camp in Maiduguri, Borno State to present items to them. While presenting the items, he noted that NIMASA as a responsible Agency will continue to work with relevant institutions in the country to provide relief to all Nigerians experiencing one disaster or another. At the camp in the Odiereke-Ubie community of Ahoada West Local Government area of Rivers State and Bakassi area of Cross River State, the Head, Corporate Communications of the Agency, Mr. Isichei Osamgbi who also represented the Agency stated that NIMASA would not relent on its efforts to complement the efforts of the Federal Government in ensuring that the IDP’s across the country are well catered for. In his words, “we understand your circumstances, we feel your pains, we know your needs; therefore, we as an Agency of government will continue to extend our hands of fellowship to support you. Receiving the materials in the various States, Local Governments and Communities visited, the representatives of the National Emergency Management Agency (NEMA) and some of the local Chiefs in the visited areas were on ground to receive the items that were bought by the Agency. They unanimously expressed gratitude to the Agency and noted that the materials donated will be used appropriately. Some of the States the Agency visited includes; Adamawa, Bayelsa, Benue, Borno, Cross River, Edo, Lagos, Niger, Rivers, Yobe and the Federal Capital Territory, Abuja. It may be recalled that aside from the regulatory and promotional functions of NIMASA, the Agency has always been at the fore front of promoting Corporate Social Responsibility (CSR) initiatives in the country as demonstrated severally in various parts of the country. The Agency has rendered assistance to victims affected by insurgency and flood amongst others.